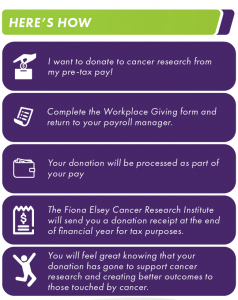 Workplace giving is a simple way for you to make regular donations through your payroll to help fight cancer and support the research work of the Institute. Organisations involved make a commitment to promote workplace giving to their staff. Many organisations also choose to match the donations made by their employees. This has shown to increase employee engagement, create a positive workplace culture and express a commitment to the Fiona Elsey Cancer Research Institute to staff and clients alike. Once a staff member has selected to support the Institute, regular donations are deducted from their pre-tax pay. A Workplace Giving system is simple to administer through your payroll system, and gives your employees tax advantages. Staff will be provided with a donation receipt at the end of the financial year for tax purposes. 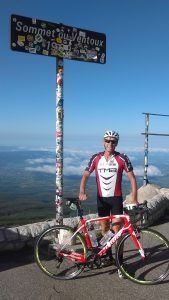 Your support will help create better outcomes for those touched by cancer. To find out how you can get your organisation involved in workplace giving, please contact us at admin@fecri.org.au or call (03) 53313 101.